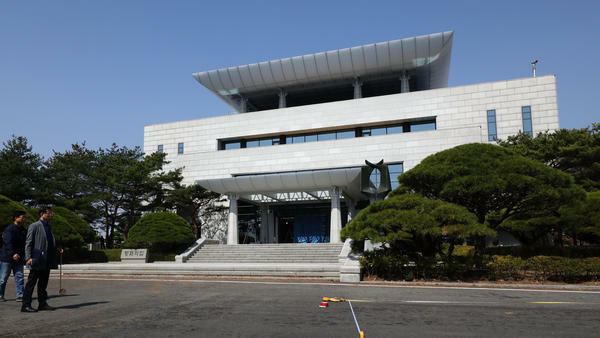 South Korean officials prepare for inter-Korean summit in front of the Peace House. Kim Jong Un and Moon Jae-in are scheduled to meet there Friday. 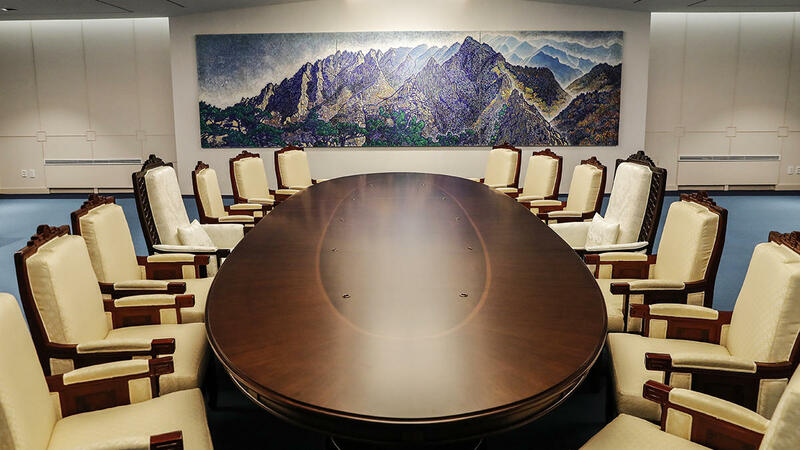 The meeting room at the Peace House in Panmunjom, South Korea. It's happening inside the buffer zone on the border known as the Demilitarized Zone, or DMZ, at Panmunjom — the already-historic site of the signing of the 1953 armistice that ended the fighting in the Korean War. The meeting is the first between Korean leaders in more than a decade. "For a long time this area has been used essentially as a tourist destination," said J. Elise Van Pool, a spokesperson for U.S. Forces Korea. On Friday, that changes. In a moment made for the cameras that will be livestreaming for the world to see, Kim Jong Un is planning to walk over the military demarcation line that has divided the peninsula for 65 years. He will be the first North Korean leader to do so. Together Kim and Moon will walk to the Peace House, a three-story, gray stone structure built with high-profile summits in mind. As construction workers furiously worked on a renovation in advance of Friday, reporters weren't let in to get a look. "On the first level there's meeting rooms for lower level delegates, and then a larger meeting on the second level for heads of state type talks. On the third floor they have a dining room [where] luncheons and dinners can be held," Van Pool described. Workers changed the meeting room itself, to include symbolic nods to unity. They put up a painting of North Korea's Mount Kumkang. They built a new table designed to look like two bridges coming together. Even the seating is significant — the two leaders are to sit exactly 2,018 millimeters (79.4 inches) apart. The agenda includes denuclearization, though definitions of that vary; arriving at some sort of peace framework since the Korean War is technically not over; and improving inter-Korean ties. Cameras will be allowed to stream the first handshake, a scheduled tree planting and a dinner banquet at the end of the day. "Look, there's a role for spectacle in international diplomacy," says Danny Russel, a vice president at the Asia Society think tank and the top East Asia diplomat for the Obama administration. "Clearly, we're in a charm offensive and Kim Jong Un is seeking to achieve an effect. Which is, he's now ready to shift gears and turn to cooperation, turn to economic development and perhaps he's not positioning himself as a responsible party," Russel said. Russel says the outcome of this summit will be a foundation for what happens at the next one, between Kim and President Trump. "The impression that President Moon Jae-in forms from that face-to-face encounter is going to be fed back to Washington and to President Trump along with other insights," Russel says. And all of this is happening at Panmunjom. For the first time the Peace House is being used by heads of state for its original purpose — to try to make peace. "It's a good thing to remind people what this area is truly meant for: to have talks and to maybe one day resolve the conflict on the Korean peninsula," Van Pool says. Seoul producer Se Eun Gong contributed to this report. North Korean leader Kim Jong Un will soon cross into South Korea for the first time ever. The summit between the rival Koreas is the culmination of a flurry of diplomacy between the two countries this year. NPR's Elise Hu has a preview from the place where the summit will happen. ELISE HU, BYLINE: Inside the buffer zone along the inter-Korean border is Panmunjom, a place that's already historic. Military leaders signed the 1953 armistice that ended fighting in the Korean War at Panmunjom. But as tensions have risen over recent years, this place, with its iconic blue meeting huts, hasn't hosted much talking between the two sides. J. Elise Van Pool is a spokesperson for U.S. Forces Korea. J ELISE VAN POOL: For a long time, this area's just been used essentially as a tourist destination. HU: This shared North-South joint security area features checkpoints and a few buildings for military and governments. But because of past violence and North Korean defections, even the shared zone is divided by a raised line of concrete. Tomorrow, the leaders of North and South Korea will meet at that demarcation line to shake hands and walk together to their summit at the South's Peace House. It's a three-story, gray-stone structure with a balcony on top. VAN POOL: On the first level, it's meeting rooms for lower-level delegates - and then a larger meeting room on the second level for heads of state-type talks. And then on the third floor, they have a dining room-type area where luncheons or dinners can be held. HU: Construction workers have been scurrying in and out for the past couple of weeks for a renovation - Van Pool. VAN POOL: It's really mostly just, I think, sprucing up - you know, adding paint and making sure that everything is good to go. HU: And changing the meeting room itself to include symbolic nods to unity. Workers put up a painting inside of North Korea's Mount Kumgang. They built a new table designed to look like two bridges coming together. Even the seating is significant. The two leaders are expected to sit exactly 2018 millimeters apart. Cameras will capture and livestream all the made-for-TV moments from the first handshake to a scheduled tree planting to a dinner banquet at the end of the day. DANIEL RUSSELL: Look; there's a role for spectacle in international diplomacy. HU: Danny Russell, now vice president of the Asia Society, was the top East Asia diplomat for the Obama administration. RUSSELL: Clearly we're in a charm offensive. And Kim Jong Un is seeking to achieve an effect, which is he's now ready to shift gears and turn to cooperation, turn to economic development. And perhaps he's positioning himself as a responsible party, a responsible stakeholder. HU: Russell says the outcome of this summit will be a foundation for what happens at the next one between Kim and U.S. President Trump. RUSSELL: The impression that President Moon Jae-in forms from that face-to-face encounter is going to be fed back to Washington and to President Trump along with other insights. HU: All that face time happening at the Peace House in Panmunjom. For the first time, the building is being used by heads of state for its original purpose, to try and make peace - Van Pool. VAN POOL: It's a good thing to remind people what this area's truly meant for. And that's to have talks and to hopefully maybe one day resolve the conflict on the Korean Peninsula. HU: On the agenda are three items - improving inter-Korean ties, coming up with some sort of peace framework and denuclearization - high hopes for a spot set to be historically significant again. Elise Hu, NPR News, on the inter-Korean border. (SOUNDBITE OF JAMES BROWN'S "UNTITLED INSTRUMENTAL") Transcript provided by NPR, Copyright NPR.